Another season is here finally hitting this area, so it's time to do another Pinspired Challenge! 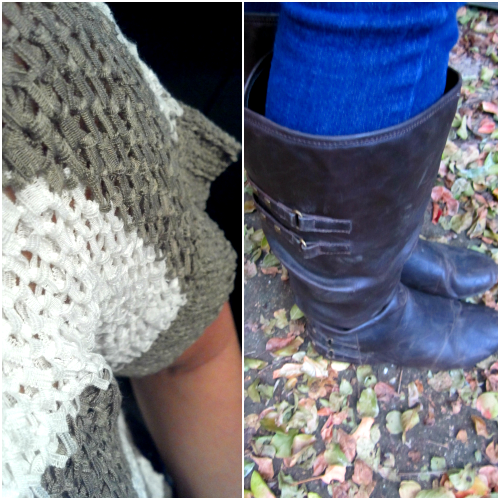 Even though it was actually 70 degrees today, it's been a lot cooler, so I feel more comfortable wearing boots and warmer clothes! I think I have my entire 10 days already planned out, and many of the outfits I should be able to match almost identically, but today I used a pin strictly for inspiration, not to copy-cat. This is the original outfit, costing $267 for the items I "copied." Instead of using a cardigan, I found an awesome short-sleeved sweater that buttons down the BACK. The sweater is actually a neat material/woven style that I've never worn before.. When I was creating this outfit, I realized that you could really turn any cardigan into a button down back and vice versa! Take out the tags, and it could really transform an outfit! If you're going out, how great would it be to have a low cut back? I'm definitely going to be trying it. Also, these boots are my 'gettin dirty' boots. They definitely show some wear and tear, but I think that's how they're supposed to be. I'm certainly not mad about it for once. It's a hella simple outfit, and not the most-exact for pinspiration, but I enjoy it! Plus- it gave me more ideas for the future. YAY!